Christmas in Colombia is not really Christmas until you make or buy tamales. During the whole month of December there are many people who make them, then give them away or sell them. 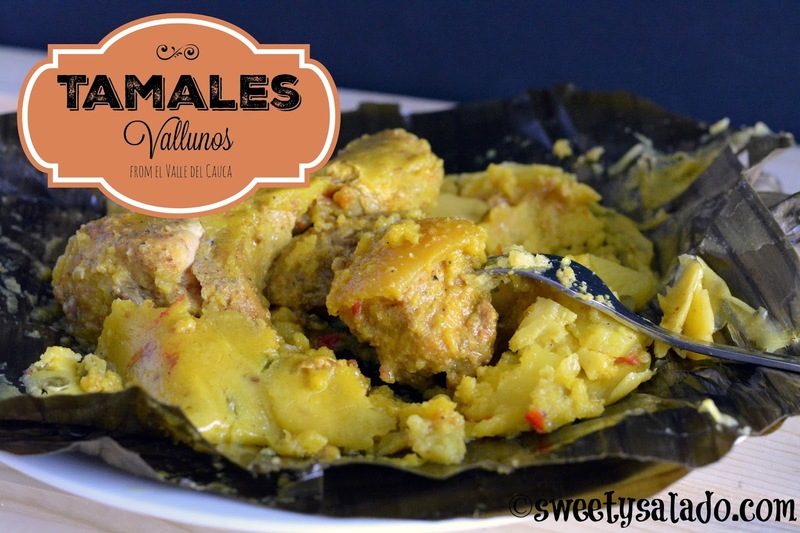 One of the most popular versions is without a doubt the “tamales vallunos” which come from the department of Valle del Cauca. They are very similar to the “tamales arrieros” or “tamales paisas”, and that’s the reason why I was hesitant to post this recipe. Besides that, I wanted to be completely sure about the differences between the two, which are not many. So, what are the differences betweem the tamales vallunos and the tamales paisas? 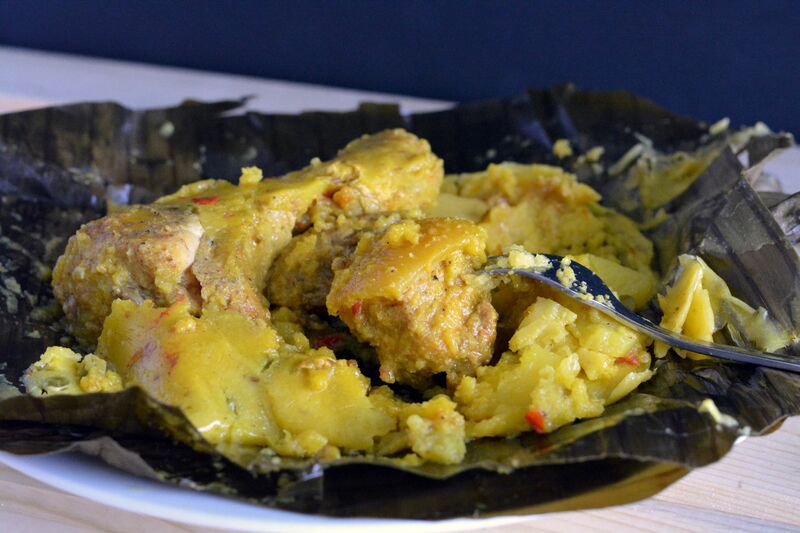 After doing lots of research trying find the answer in my Colombian cookbooks, searching on the Internet, as well as asking family and friends, the only two differences I found were that in the tamales vallunos the meat portions are much bigger and that they are also made with chicken. If you remember, the tamales paisas are only made with pork. Besides those two differences, the process is the same and that’s why I season the meat, the guiso (seasoned sauce) and the masa (dough) the same way I have always made it, because it gives the tamales such great flavor. And why change the seasoning if everyone loves it, right? Day 1. The night before, blend all the ingredients for the marinade in a blender or food processor. Put all the meat in large resealable plastic bags or plastic large bowls and add the marinade. Cover and refrigerate overnight. If you're using frozen banana leaves, you can thaw them out by leaving them in the fridge overnight. Day 2. Carefully take the banana leaves out of the bag and cut them into rectangles, approx. 20 inches long (50 cm). Clean both sides of each leaf with a damp cloth or paper towel. If the leaves are fresh and stiff, you can pass them over a stove burner set to medium low for a few seconds to soften them. This also helps to avoid cracks. Peel and cut the potatoes into thick slices and place them in water in a medium bowl. Season the water with salt and the all-purpose seasoning to taste if you want. Peel and cut the carrots into slices and place them in water in a small container. Season the water with salt to taste if you want. To make the guiso or seasoned sauce: In a large pan, heat the olive oil at medium heat and add the onion, cook for 3-5 minutes or until it's translucent. Add the green onions and garlic and cook for 1-2 more minutes. Now add the red bell pepper, chicken bouillon, all-purpose seasoning, and salt and pepper. Stir well and cook for about 5 minutes or until the pepper softens. Add the tomatoes, reduce the heat to low and cook for about 10 minutes or until the sauce thickens. Add a bit of water if the sauce dries up. To make the masa (dough): Place the water for the masa in a large pot, add the chicken bouillon, all-purpose seasoning, onion powder, garlic powder and salt. Heat the water on the stove without bringing it to a boil. Then, slowly add the pre-cooked corn meal and stir with a spatula or wooden spoon until it looks like thick oatmeal. If the masa dries up, you can add more water. Add the peas to the masa, stir well and remove from the stove. To assemble the tamales: Place two banana leaves one on top of the other in the form of a cross. Make sure the underside (the side with the grooves or veins) is facing up and the top side (smooth) is facing down. Spread about about ¼ cup of masa over the leaf with a spoon. Add one tbsp of guiso over the masa. Place on sprig of parsley over the guiso. Place 1 piece of pork meat, 1 piece of pork belly and 1 piece of chicken over the masa. 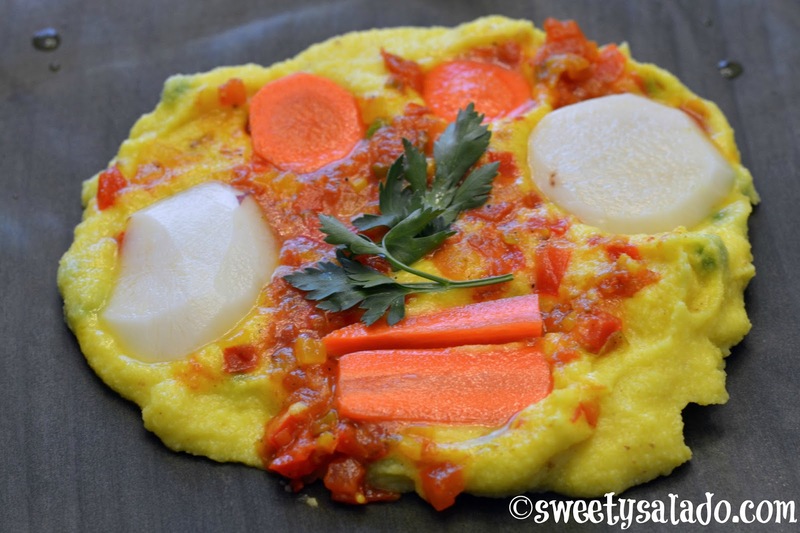 Place 2 potato slices and 2 carrot carrot slices in the masa. Close the tamal by putting the sides of the leaf together in the center and tucking them in, fold in the top and bottom sides as well to make a packet. Tie them up with butcher string. Repeat this process with every single tamal. To cook the tamales: Fill ¼ of a large pot (tamalera) with water and season with salt. Bring water to a boil and then place a steam rack inside the pot to avoid letting the tamales touch the bottom or the water. Note: If you don't have a steam rack you can place sticks or left over banana leaves in the bottom of the pot instead. Place the tamales on the steam rack one on top of the other and steam them on low heat for about 1 hour and 45 minutes to 2 hours. Check the water level every 30 minutes to prevent it from evaporating completely. Once the tamales are ready, take them out and let them rest for a few minutes before serving.